With so many to choose from, which types of floors do you choose? 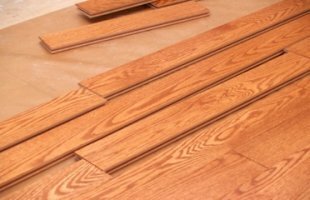 Solid Hardwood Floors, Engineered Hardwood Floors, or Laminate WoodFlooring? Whether it's Solid, Engineered, or Laminate. The following information, will help you determine, which of these types of floors are best for you. 3/4 Solid wood flooring are found commonly, in most homes, whether it's pre-finished or unfinished hardwood floor. The general installation method used is a staple/nail down method. They last long and have very little problems with them. These type of flooring are fasten to the subfloor by using a nail/staple down installation method. 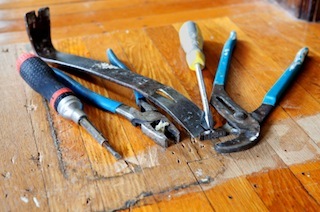 You can install your own floors with the proper tools and save money from hiring a flooring contractor. They're normally installed above grade, 1 rst or 2nd level of home. Away from areas that has moist air vapor, which can cause buckling or cupping. Although, with the right type of subfloor, it can be installed below grade also. If, you're finishing that basement, you can also use this type of hardwood flooring. Due to it's thick wear surface. The life of a 3/4 wood flooring is longer compared to 1/2 or 3/8 solid wood flooring. With these types of floors, you're able to refinish the wood flooring more often, to remove damage or just have a new clean look. You may want to consider the different hardwood floor thicknesses available. If you need to match a height, or have a height restriction. Areas like under baseboard heating or appliances. Otherwise, always use 3/4 thickness, when installing wood floors. They'll last longer, Which makes it a better investment. Engineered hardwood floors are commonly used in basement areas (below grade application), over a concrete subfloor. The installation method used for this flooring are glue down flooring, floating flooring and staple down flooring. With it's stability and construction style, it can be installed with ease. Use oil base(recommended)polyurethane flooring adhesive (see installation section, for more details), when installing engineered flooring. Polyurethane hardwood flooring adhesives have a longer open time, so there is no rushing. And is a better vapor barrier, than the latex base flooring adhesives. These types of floors can be installed as a floating floor. You can have a soft surface to walk on, which is more comfortable on your feet and back. Engineered hardwood floors can be installed above or below grade. Regardless of what type of climate condition you live in, wet or dry. You'll be able to install this type of floor, in your home, with no problems at all. Engineered wood flooring are more stable than solid wood flooring. Expanding and contracting is reduced, which will prevent buckling, cupping and gapping. Concrete subfloors will constantly give out vapor. Which can cause all kinds of problems, if you install a solid hardwood flooring. Engineered hardwood floors have a plywood style construction, this types of floors is perfect for installation over concrete subfloors. With a direct installation, there's no need to install a wooden subfloor, which makes it less work and more time to enjoy other things. When you decide to purchase, this type of floor. Select one with a thick wear surface or layer(depending on your budget). It will last longer and money will be well spent, and you can refinish the hardwood flooring 3 or more times. A thinner wear surface, will save you money, but the life expectancy of your engineered hardwood floors will be short. A thicker wear surface is a smarter investment. 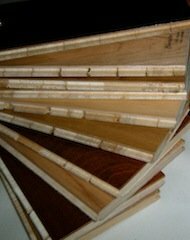 Engineered flooring are available in thicknesses from 3/8 - 3/4 thick. So matching a specific height, should not be a problem. Laminate Flooring is a photo image, laminated on either a paper backing or plastic type material backing. Which gives an artificial look. These types of floors are generally installed as a floating floor. Which will give you extra comfort, for your feet. Laminate flooring are durable and can last a long time. They're built to withstand high traffic at a low cost. They cannot be refinished. I don't recommend using this types of floors(my opinion) in a commercial area such as a restaurant or retail store. Commercial spaces like these get excessive cleaning. Water can find its way between the joints over time. Causing laminate flooring to cup, and weaken overtime. "I've seen a restaurant, that had this type of problem." Use this type of flooring, in an area that won't get excessive mopping. 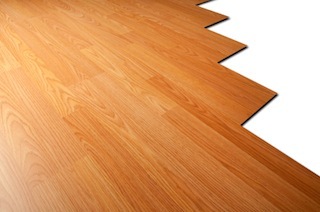 Living room, dining room, bedrooms, family room are best areas to install your new laminate flooring. Your investment will go further. Pre-finished, Unfinished, Solid, Engineered or Laminate? With all this information you should be able to select the perfect type of wood flooring for your home. Choose one and I'll help you install it!